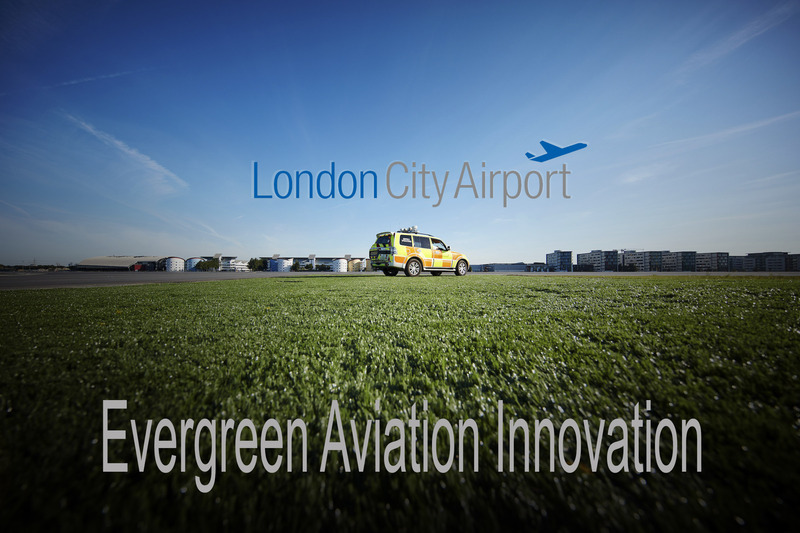 As the first airport in Europe, London City Airport has installed a special type of artificial turf from the Danish company Evergreen Aviation. Artificial turf can be the right solution when you want to be independent of the seasons and of the elements of natural grass. It is popular for especially football fields, but now aviation is also among the buyers of artificial turf. London City Airport is thus the first European airport with artificial turf, which is produced by the Kokkedal-based company Evergreen Aviation, and has been described as “future-proof”. The special artificial turf from Evergreen Aviation is called Aviation Grade Artificial Turf (AGAT) and is an innovative form of artificial turf. London City Airport were looking for a long-term and eco-friendly solution to the ongoing problem of bird strikes and at the same time to minimize maintenance costs. In early August, a trial area of approximately 400 m2 was installed with artificial turf in the jet blast area of Runway 27 and Taxiway M. In this particular area there is a risk that the planes send loose objects flying off due to the engines high levels of jet blast. A problem that is rectified by replacing natural grass with artificial turf, where the risk of flying objects is smaller. “The installation took place in an area of the airfield where the aircraft do a particular manoeuvre to line up on the runway. As they turn around, that particular area is exposed to high levels of jet blast which made it the ideal location for a trial” said Charles Joubeily, project manager at London City Airport. “Since the installation, there have been no issues with the AGAT,” he added. “Airfields are always being inspected and there have been no issues reported so far. AGAT is easy to maintain and has a proven ability to reduce and prevent erosion by jet blast. The synthetic grass, made of plastic, is sustainable and with the grass’ short length and lack of natural flora keeps birds and other animals from staying on the grass in pursuit of food or shelter. This in turn reduces the risk of bird strikes on aircraft – a particular concern in city-centre airports. London City Airport is undergoing a major expansion, including a parallel taxi ride along the entire runway. In connection with this construction work, the airport hopes to invest in artificial turf in all grass areas – an area of ​​approximately 160,000 square meters. “The airport has not had any challenges with the artificial turf, even though it has had heavy rain. An area of ​​400 square meters is too small to have any impact on bird strikes, but if artificial turf replaces all natural grass, we will remove the presence of mice, rats, geese and other birds. The airport expects to reduce bird strikes by 16 to 32 percent,” explains Nikolaj Duckert. Another advantage of artificial turf is that emergency vehicles may cross the turf without getting stuck, provided of course that the sub-base is solid. Likewise should an aircraft overrun the runway, it should be able to manoeuvre itself back on the runway. Evergreen Aviation has tried to sell artificial turf to many different airports – including some Danish ones – but nobody has dared to take the first move, despite the interest in the product.”There are some airports in the US with artificial turf, and London City Airport has proved to be an ice breaker compared to other European airports,” concludes Nikolaj Duckert.